From Southwest Minnesota to Northwest Iowa, if you're in the market for a new or used vehicle, look no further than Vern Eide Mitsubishi of Sioux Falls. Proudly serving Sioux Falls, Harrisburg, Tea, and Brandon with unmatched quality and superior customer service, the Eide Effect is always on full display at Vern Eide Mitsubishi. What is the Eide Effect? It is the belief in treating our customers, employees, and community as we ourselves would want to be treated. It doesn't matter what your automotive needs might be, our experienced sales team and trustworthy service technicians will help you every step of the way. Stop into Vern Eide Mitsubishi of Sioux Falls for your next vehicle purchase or auto repair for a different type of dealership experience. 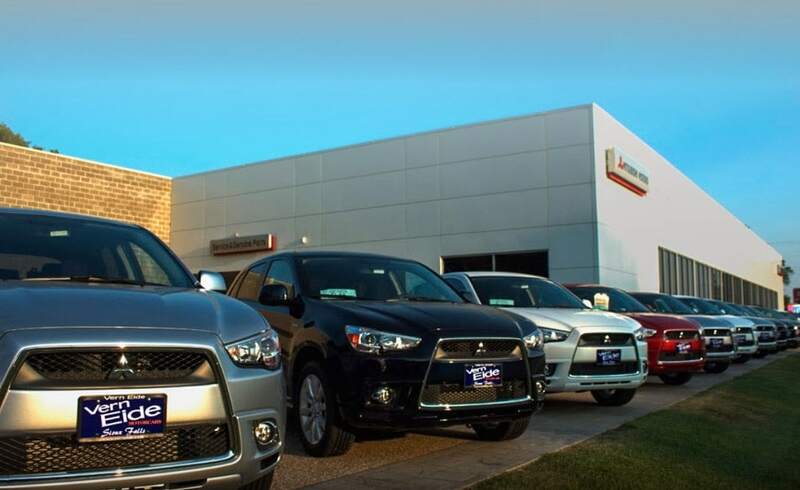 Since opening our doors, Vern Eide Mitsubishi has maintained a solid commitment to our customers, offering a wide selection of cars and trucks with an ease of purchase. Vern Eide Mitsubishi has a professionally managed service and parts department open extended hours to accommodate our customers' busy schedules; and, as always, Vern Eide Mitsubishi offers competitive pricing for your automotive maintenance needs. Please feel free to contact us at (605) 373-8111 if you have any questions or comments.